None of those items is a national headline grabber. EPA has bigger story to tell but you’ve got to use the agency’s search engine to find it. 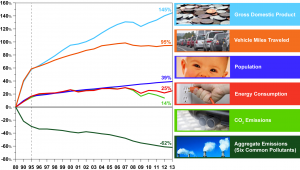 This week EPA updated its annual Air Quality Trends, and the news is fanastic. 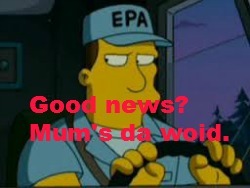 “National average air quality continues to improve as emissions decline through 2013,” EPA reports. 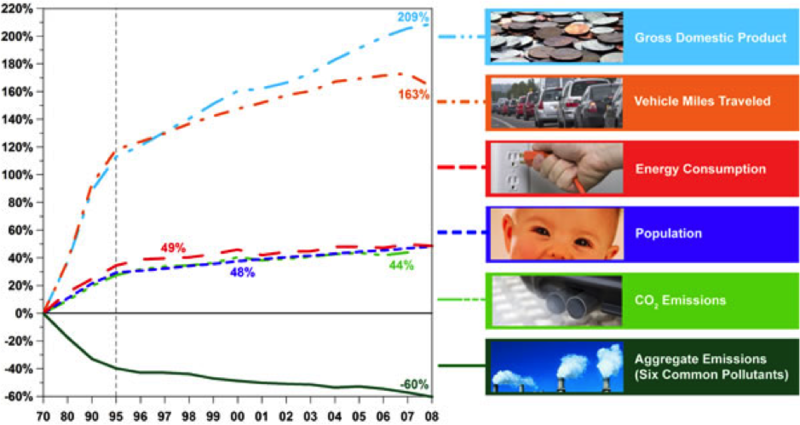 The figure shows that between 1980 and 2013, gross domestic product increased 145%, vehicle miles traveled increased 95%, energy consumption increased 25%, and U.S. population increased 39%. 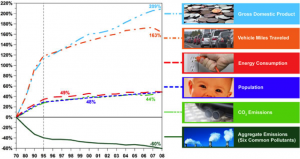 Yet during the same period, total emissions of the six principal air pollutants decreased by 62%. Impressive. 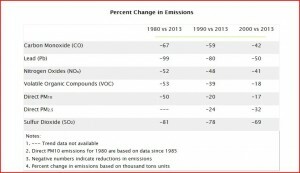 “The graph also shows that between 1980 and 2012, CO2 emissions increased by 14 percent,” EPA adds. Well, to me, it’s all good news. Air pollution emissions are increasingly decoupled not only from GDP, VMT, energy consumption, and population, but from CO2 emissions as well. In other words, CO2 emissions are positively correlated with increases in wealth, mobility, super-human power at the beck and call of ordinary mortals (i.e. energy consumption), and air quality improvement. Those who argue or insinuate that we need a carbon tax or CO2 regulation to clean the air don’t know what they are talking about. 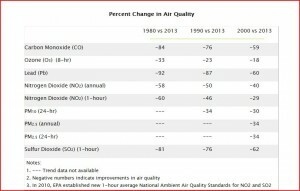 Let’s look at other EPA charts on America’s improving air quality. 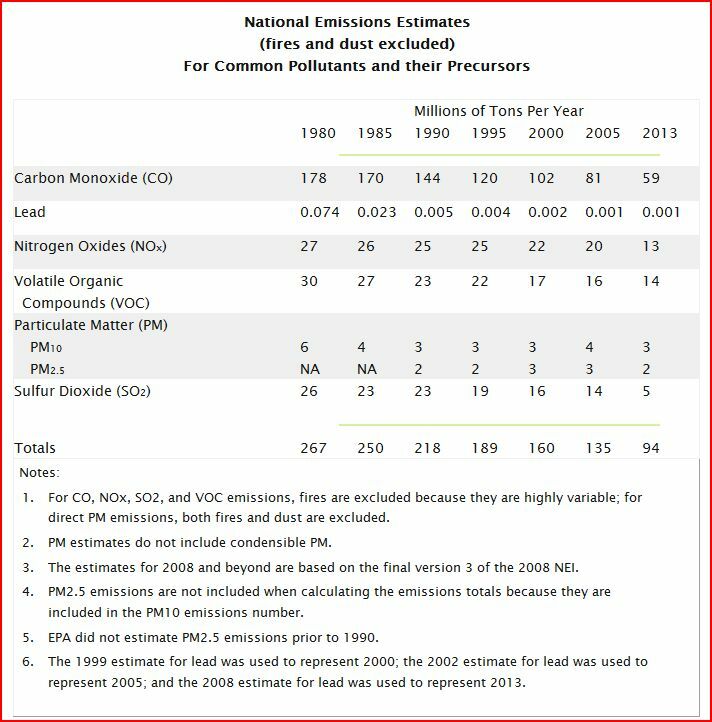 Note: Most of the progress of occurred in the past 23 years, and, except in the case of PM10, the most rapid progress occurred in the past 13 years. 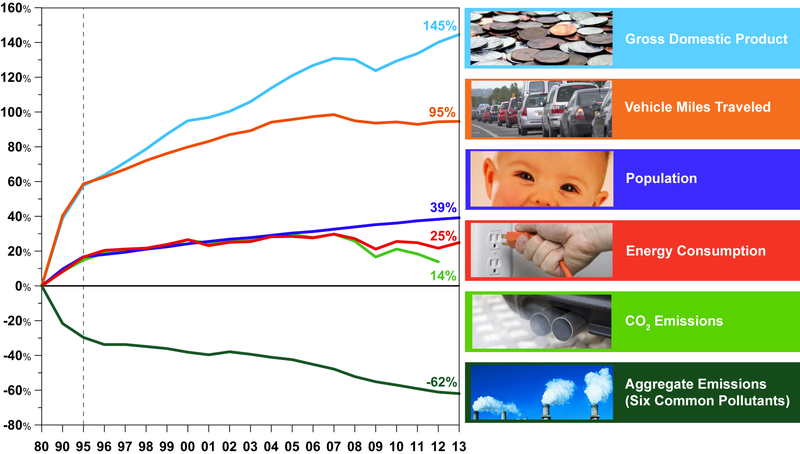 Pollution reduction is accelerating. 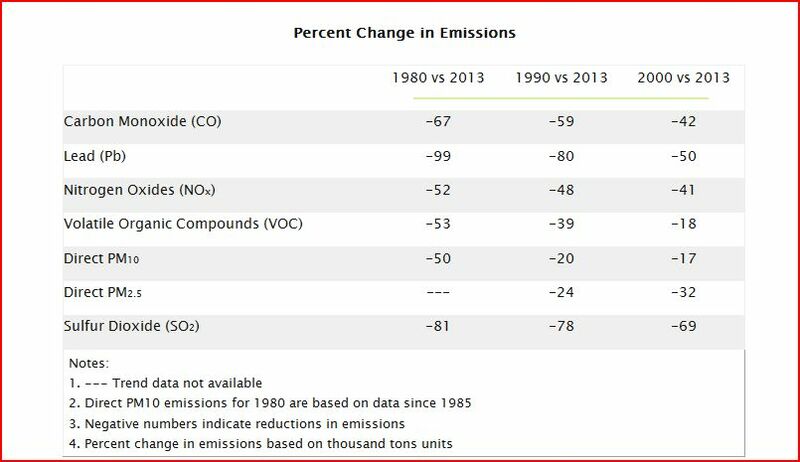 Aren’t the latest air pollution trends data more newsworthy than greenhouse gas emissions data from large facilities? Why does EPA relegate the good news on national air quality to the ‘back pages’ of its Web site while headlining less consequential matters on the ‘cover page’? One can only speculate. A not unreasonable suspicion is that publicizing environmental good news could spoil the fear-and-alarm narrative on which EPA depends for its budget, prestige, clout, and assorted power grabs. 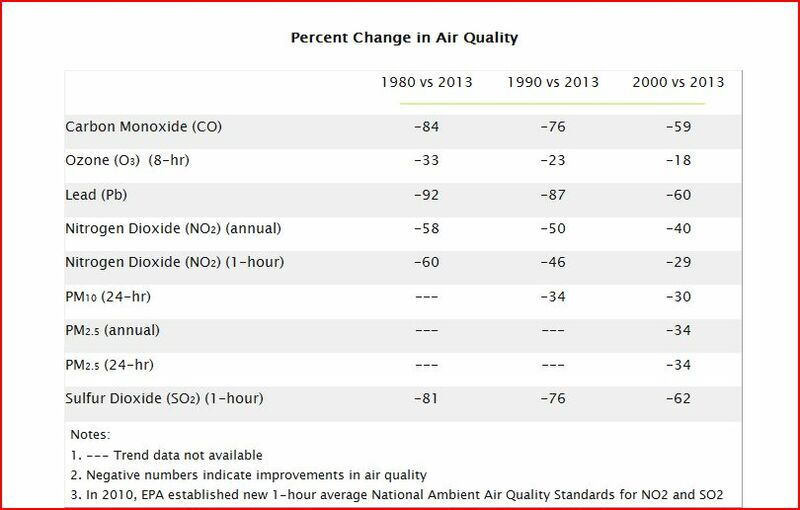 In fairness to EPA, the bottom of the landing page boasts that “Over four decades, EPA has cut air pollution 70%, while our economy has grown 3X larger.” But when you click on “more” for additional information, you don’t come to the page on air quality trends. Rather, you come to the page on EPA’s Clean Power Plan, the agency’s scheme to dominate state energy policies. 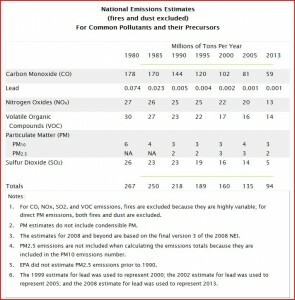 Previous post: How Unlawful Is EPA’s Clean Power Plan? Next post: Will eBay Stand with ALEC?